Samuel Scheidt is one of the finest of the North German school of organist-composers that stemmed from the teaching of Sweelinck in Amsterdam. Born in Halle in 1587, he became assistant organist the Moritzkirche in 1603, before studying in Amsterdam between 1607 and 1609. He returned as Court organist to the Margrave of Brandenburg in Halle, where he was soon joined by Michael Praetorius. The Thirty Years War disrupted musical life in Germany. The Margrave fled, and the music of the Court ceased. Scheidt took to private teaching before eventually becoming director of music for the major Halle city churches (Marketkirche, Moritzkirche, and St Ulrich). In 1624 Scheidt wrote his monumental three-volume Tabulatura Nova, an important collection of works for organ, harpsichord, or clavichord. Scheidt never recovered his earlier financial security and died in some financial trouble. 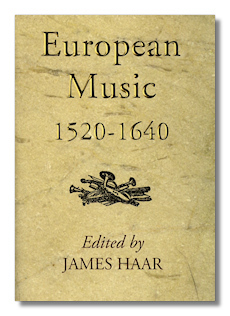 His last publication was this 1650 Görlitzer Tabulaturbuch, named after the city that commissioned the collection of four-part harmonisations of Lutheran chorales. 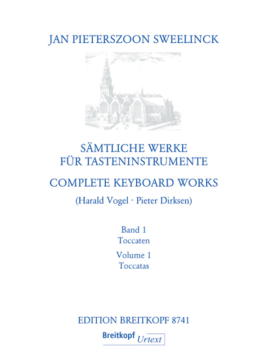 Although there are a few simple harmonised settings, many of them are adventurous little pieces demonstrating Scheidt’s advanced keyboard technique and musical thinking as the early Baroque style of composition developed. Whether or not you would ever use them in a liturgical setting (as seems to have been intended, judging from Scheidt’s introduction where he mentions that the pieces are for “gentlemen organists to play with the Christian community”), they are worth exploring. This Schott edition is clearly printed, in landscape format. The introduction by editor Klaus Beckmann (in German and English) gives background to the pieces and the editorial process. The critical commentary is, as usual, only in German. Preview pages can be view here. This is apparently the last in the Schott series ‘Masters of the North German Organ School‘, although I hope that is rethought as scholarship on this important repertoire continues to evolve and there must be more composers and pieces to be discovered and edited. Gottlieb Muffat is one of those unfortunate composers who is overshadowed by his father, in his case, Georg Muffat. The latter was one of the key instigators of an international keyboard style, infusing the Italian keyboard influence of Frescobaldi with musical influence from France. Gottlieb is generally known, if at all, through his connections with Handel, who ‘borrowed’ an extraordinary amount of his music, notably in the Ode to St. Cecilia’s Day, Samson, Joshua, and Judas Maccabeus. mostly from the six Suites in the 1736 Componimenti Musicali. 2017 is the anniversary of Melchior Schildt’s death, so it is an appropriate time to look at his, sadly, very limited, surviving organ music. He was born in 1592 in Hanover to a family of musicians stretching back more than 125 years. He studied with Jan Pieterszoon Sweelinck from 1609 (probably until 1612). In 1626 he was appointed court organist to the Danish king, and in 1629 returned to Hannover to replace his father as organist at the Marktkirche, where he stayed until his death. Volume 1: Edition Breitkopf EB8801. Volume 2: Edition Breitkopf EB8802. The new 10 volume Breitkopf & Härtel critical edition of Bach’s organ music is arriving in dribs and drabs. I reviewed volume 8 here last July, and have now been sent Volume 3. It contains all the pieces entitled ‘Fantasia’ together with isolated Fugues. In that context, it is worth stressing that there are no surviving authorized and complete Fantasia and Fugue pairs, not even the well-known Fantasia & Fugue in G minor (BWV 542). Indeed, many of the popular Preludes and Fugues were also put together by later editors, rather than by Bach. 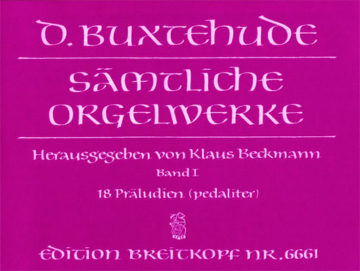 Dietrich Buxtehude holds a special place in the hearts of most organists, although this is occasionally because he is the only pre-Bach German composer that they are aware of. But, despite many years of musicological research and publications, he still remains a somewhat enigmatic composer. There is still no agreement as to his birth date or place, and what his name really was. He seems to have been born in Helsingborg (in present day Sweden, but then part of Denmark) as Diderich, but later changed the spelling from the Danish to a more Germanic Dietrich (or Dieterich). His surname also appears in several versions, including Box de Hude. Jan Pieterszoon Sweelinck (dubbed the ‘Orpheus of Amsterdam) was one of the most important keyboard composers at that musically fascinating period at the end of the Renaissance period and the start of the Baroque. Born in 1562, he was employed by the city of Amsterdam as organist of the Oude Kerk for 44 years until his death in 1621. Organ music in the Calvanist church was limited to occasional playing of pieces to familiarise the congregation with the choral melodies, before or after the service, but not during. So Sweelinck’s duties as city organist were generally to give concerts for the public and visitors. This have him time to build up an extensive teaching practice, attracting a generation of North German organists who returned to develop the influential Hamburg organ school that dominated the 17th century, culminating in the music Buxtehude in nearby Lübeck. His music was known throughout northern Europe, with two of his pieces includrf within the Fitzwilliam Virginal Book. 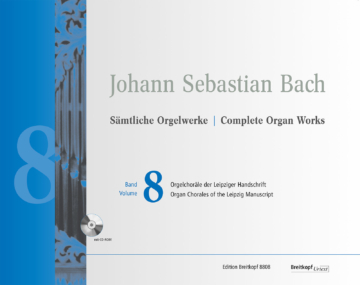 Editions of Bach’s organ works are something of a minefield, even when there are clear autograph scores available. In many cases that is not the case, so the role of the editor and the availability and accuracy of available sources becomes an important consideration. Of all the publishers to be involved in Bach, Breitkopf & Härtel are perhaps the most appropriate. Founded in Leipzig in 1719 four years before Bach took up his post there, they were the first to publish the complete works of Bach, between 1851 and 1900 for the Bach-Gesellschaft. 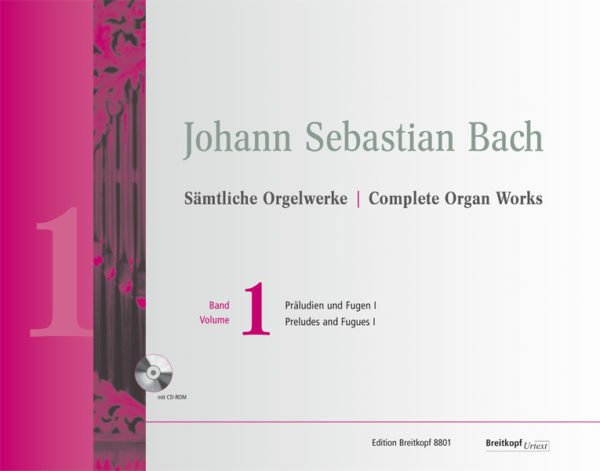 Unfortunately, at the moment, I only have access to one volume of their latest complete Bach Organ Works, so cannot comment on the 10 volume set as a whole. The medieval cult of saintly relics has left us with some glorious examples of art, architecture, literature and music. But the studies of historians generally focus on one of first three of these aspects in isolation. 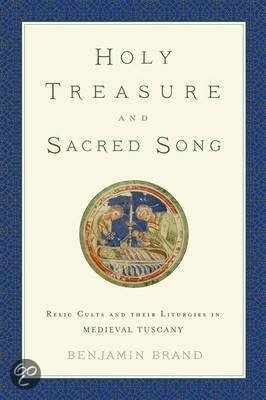 This book aims to redress the balance by focussing on the musical aspects but within the context of the rich story of politics, power and influence, the complex history of monasticism and liturgy, and the artistic outpouring that the devotion to relics generated. It covers the period from around the mid-eighth century to the thirteenth in Tuscany. It is an extension of a Yale PhD thesis by musicologist Benjamin Brand. Andrew Parrott is one of the leading members of a particularly influential generation of musician/scholars who founded performing groups in the 1970s: in his case, the Taverner Consort, Choir and Players, founded in 1973 . They changed the way that we think about, perform, and listen to, ‘early’ music. Unlike many conductors who cut their teeth in the world of period performance, Andrew Parrott has retained his strong research interests, notably around the music of Bach and Monteverdi. Perhaps best known for his book, The Essential Bach Choir (published in 2000), an expansion of the theories of Joshua Rifkin that Bach’s choirs were essentially performing as one to a part, Parrott remains an essential component of the early music world. Hence the importance of his latest book: Composers’ Intentions? Lost Traditions of Musical Performance.